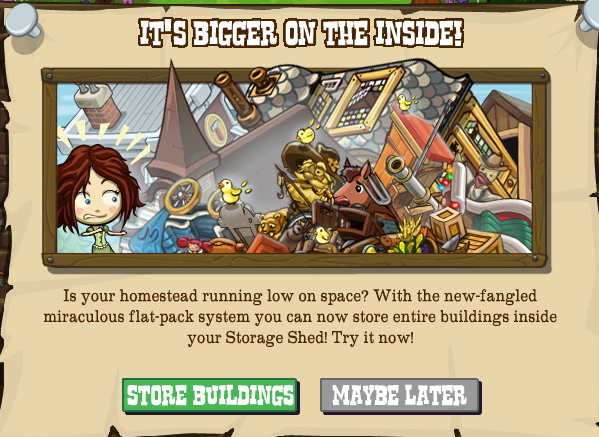 News - Frontierville Express - More Than Just A News Site: The Storage Shed - Bigger on the Inside! Have you ever wished your little Storage Shed could fit your Cabin in it? Silly, right? I mean, it's TINY! HOWEVER, as of today our shed has taken on a whole new Tardis like quality so you can now store various buildings in it! Kennel, News Stand, Pet Shop, Flower Shop, Kissing Tree, Pony Express, Blacksmith, Cabin, Chapel, Inn, Trading Post, Wagon, Tailor Shop, Foundry, Graveyard, Horseshoe Pit, Land Office, Jackalope Lodge, Sawmill and Toll Booth! Water Well, Barn, Storage Shed (makes sense), Chicken Coop, General Store, Schoolhouse, Barber Shop, Ponderosa Lodge, Doctor's Office, Finkertons, Groundhog Trap, Beehive, NYE Dancefloor! What do you think about this? Personally I think it is great! Come and have your say at our Facebook Fanpage!